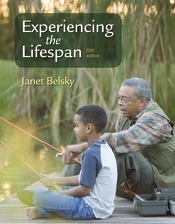 Janet Belsky’s Experiencing the Lifespan always reflects a scientist’s understanding of key research, a psychologist’s understanding of people, and a teacher’s understanding of students. This updated new edition features significant new findings, a broad-based global perspective, and enhanced media offerings. In a highly conversational style, with pedagogy that reinforces learning, and with examples drawn from an extraordinarily broad range of cultures throughout the world, the book remains at just the right length and level of coverage to fit comfortably in a single-term course.